Authentic leadership refreshes the soul. When encountered such leadership is both recognized and remembered. This week’s passages are an invitation to lead authentically in light of the gospel of grace and truth. First, in Joshua 3:7-17 we learn that authenticity means leading like we have Jesus preceding us, because we do. When the Lord called on Joshua to assume the mantle of leadership from Moses, he didn’t put Joshua all the way out front. 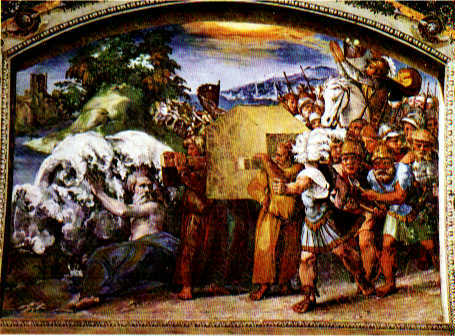 In front of Joshua was the ark of the covenant, an incarnation of the presence of God with his people. Joshua said to Israel, “See the ark of the covenant of the Lord of all the earth will go into the Jordan ahead of you.” As Christians, we don’t have this. We have a better incarnation: Jesus himself. Let us therefore lead like Jesus is preceding us. There are times as a dad, a husband or an employee that I feel like I just don’t have it in me to lead as I ought. Yet when I remember Jesus in front of me it’s so much easier to take the next step forward. Second, in Psalm 107:1-7 we learn that authenticity means leading like we know where we are going and we know how to get there. “But I don’t know where I’m going much less how to get there,” you may object. This passage tells us where we are going: to a city in which we can live (v. 7b). How will we get there: easy, the straight way (v. 7a). A colleague shared with me this week how his church is growing and thriving. Nothing fancy: they are just loving people, starting with the kids of the area through their Awana program, and then on from there to the kids’ parents. It isn’t rocket science: it’s merely taking the straight way to the place God intends for us. Third, in Matthew 23:1-12 we learn that authenticity means leading like its not about us. Why? Because it’s not: it’s about Jesus, and God’s redeeming the world through Him. It’s not about having the right color robe, it’s not about the size of the church, and it’s certainly not about the kind of Bible we carry much less the positions we hold. It’s about humbling ourselves that we might be used as God intends. For whoever exalts himself will be humbled, and whoever humbles himself will be exalted (v. 12).Fourth and finally, in 1 Thes. 2:9-13 we learn that authenticity means leading like a father would his children (v. 11). How does a father provide good leadership for his kids? By encouraging them, comforting them, and urging them on into the calling God has on their lives (v. 12). This is how Paul led the Thessalonians and this is the example we are challenged to follow. What a joy a father has when he can pour out his heart to his kids by encouraging them when they are sad, comforting them when they are hurt, and urging them on into a life walk worthy of being called into God’s kingdom and glory. Would that such authentic leadership would break out all around us to the grace and glory of our Father in Heaven who leads us in these very same ways. Where and when in your life have you experienced authentic leadership? Was there something in that experience that resonates with what is being described here? This entry was posted in Religion on October 23, 2011 by Steve Godfrey.